The most romantic of getaways . . . Forget the long hotel corridor with the anonymous rows of bedroom doors. Forget the bare wooden boards of a cold glamping pod. Discover the private and personal world of a really comfortable and rather luxurious sanctuary – discover RiverBed! If you’re looking for luxury cabins with hot tubs, you’ve come to the right place! As you approach your wee lodge on a private, wooden board-walk through the trees, you begin the adventure. Catch a glimpse of the surrounding golf course through the leaves, or look beyond to the glistening waters of Loch Linnhe. You pass the bubbling hot tub just outside your river-side home, then open the lodge door and come inside! 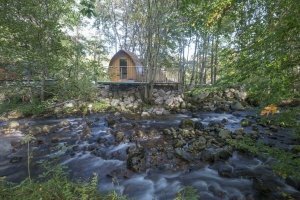 The wee lodge is superbly crafted in Scotland, to offer a truly comfortable experience. With space at a premium (this 12 square meter lodge houses bedroom, kitchenette, en-suite shower room and lounge, all in one!) each square inch has been cleverly considered and brilliantly engineered. The aim is to create a castle in a cabin, and approach the art of hospitality in an innovative, new way. The Wee Lodge is packed with electrics – starting from the pod coffee machine with complimentary Costa Coffee, through to microwave, fridge, TV, hi-fi and so on. In fact, including a toaster and the kitchen sink! The en-suite shower room is a wet room with toilet : it’s not a big area (certainly no room for the cat to swing), but the water is hot and the towels are lovely! As well as enjoying the towels, you’ll savour the Egyptian Cotton laundry on the bed and the light and airy nature of this special place (the high ceiling creates a great sense of space). When evening comes, there’s a special, colour changing LED light system to play with. Or more interesting perhaps to venture out for the evening and explore the inns and restaurants of the area! There are really good choices here, either a short walk away or within the villages and communities around the loch. In the morning, we hope the sun will be shining so that you can sit on the veranda and enjoy the complimentary continental breakfast in a magical setting: poised above the water with background music of the bubbling brook. Your wee lodge is serviced each morning: with fresh milk, croissants, courtesy items etc refreshed. Bliss. Check availability and book securely online. Like Special Places? You'll love it here! Book your Winter break now! £30/night OFF, Complimentary Prosecco, Bath Robes, Late Checkout and much more! Visit RiverBeds in the wonderful winter and enjoy the luxury. stylish wee lodges in a very special setting.